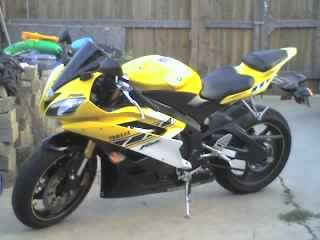 Description It was a 50th Anniversary R6 that was Yellow and Black with side panels of White. It has a Double Bubble wind screen that is Smoke in color. I had removed the rear fender and wired plate on. So there are Scratches from plate where it would be located and they are black. Also had a little nick in the rear section on the left side if facing from rear. Back tire was bald. I had about 7700 miles on the bike also. Please anyone help I had no insurance at the time!!!! !